I was pleasantly surprised when I opened up my Jan 2009 copy of PC Magazine . 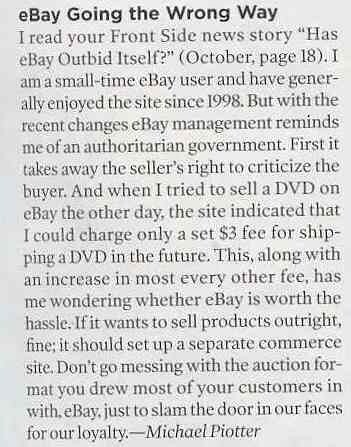 I have been an avid reader of the magazine for some years now, and after reading an article they had published in response to change to eBay.com and it’s changes in fees and philosophy, I felt compelled to write back. Apparently, someone thought I made a good point and put it in the editorial section. I am pretty stoked about it. It is kind of odd too, because that Jan 2009 edition of PC Magazine is the last print copy of the magazine. They are going totally digital after that edition. So, I guess it’s a milestone edition and I got published in it. Maybe it could be a collector’s item? Having been a seasoned eBayer from my early excursions on the newly minted inter-net to present, it’s starting to sadden my auction browsing experience. Since eBay ditched it’s latest CEO for a new, fresh CEO, the company has taken some fairly drastic steps to change it’s business model while cutting away the almost utter devotion most avid users had for the service/community it created. It has been slowly evolving. First they raise prices for things, which justified or not almost always happens with any floundering and/or greedy business. Next they decided to take away the voice of reason that many a trustful and honest eBayer relied on, the positive/negative feedback tool. Now a seller cannot complain about a deadbeat buyer, but the buyer can continue to blast you as a seller without real visible recourse. The latest indiscretion is what really makes you wonder what will come next. Now eBay is insisting that you ship products out for a set price, no mind whether the time/energy to ship at that price is even relevant. I’ve read that eBay is trying to cater to the larger sellers on eBay with it’s fees and Buy-it-now auctions, but with all the changes and the utter disregard for the small time buyer/seller, eBay is cutting it’s core audience to the bone. They are slowly morphing into a online storefront. Gone will be the entertainment and candor of possibly the first internet e-tailer that really had a compelling reason for people to get on the internet and buy/sell almost whatever you could dream up on a site originally dealing with Pez dispensers. It annoys me and I can see myself shying away from the site due to this continued behavior. The vacation was a whirlwind, but fun. Everyone says we packed in quite a bunch of things for the full week we were gone. Flew into San Fran Sunday night, and drove north through the city and Golden Gate up towards Wine Country. Next day toured Budweiser Beer & Jelly Belly factories and Wine country that afternoon. Wine country was hot and after a bit, it got boring with all the places that wanted to take your money for anything wine-related. That night headed south and met with my friend Nicole (she was the one I visited out in MI last summer). Headed to Yosemite for the next full day. Communed with nature, hoards of tourists and sickening mountain roads. Next day toured gold mining history, a current gold mine and a awesome cave. After that drove into Silicon Valley, where we saw Yahoo, Google and Apple to varying degrees. All were in office/industrial parks, with no real touristy type stores, save for Apple. We actually walked into Google’s campus and checked out their front office. Elyssa was scared about security, but we didn’t meet any until after we walked off the property! My highlight for sure. Next two days were spent in SanFran. Did self-guided walking tour that Friday, walking a few miles from downtown/Chinatown to Fisherman’s Wharf. Good lot to see that day. Went on Bus tour the next day and out to Alcatraz that afternoon. Was a very good trip, one I’m glad we took, even if we planned a good chuck of it on the fly!